Will more rural Protestant families move away from the border and into Enniskillen? AFTER Scotland’s #Indyref put `borders’ back on the political agenda, journalist Denzil McDaniel looks at how social change could be shifting the border in his native county. IF the Northern Ireland Assembly survives beyond 2015, one of the issues that will come back into focus in its next term is if and when a border poll will be held. On the face of it, voters would have a simple choice of whether to remain in the United Kingdom or become part of a united Ireland. The ramifications of a vote either way are not so straightforward, and practicalities of moving forward are complicated to say the least. Even the question of where or what the border actually is opens up a decades-old analysis of changing circumstances. The snaking line on the map is the easy bit; the 220 or so miles from the Foyle in the north-west to Carlingford in the east, hurriedly drawn up to delineate the six counties which remained within the UK and formed the new Northern Ireland in 1921. By the mid-1920s, a Boundaries Commission was set up, but couldn’t get agreement, to tweak the border and take account of such subtleties as Protestants in parts of Donegal who suddenly found themselves in the new Free State, and Nationalists in south-east Fermanagh cut off from a hinterland around Clones, regarded as really a Fermanagh town but geographically in County Monaghan. Such quirks have had implications throughout the almost 100 years of partition. The land border between Northern Ireland and the Republic was never an international frontier in the full sense of that term; passports, for example, didn’t have to be produced at Customs posts which were set up on both sides. But over decades, such things as the smuggling of butter was a manifestation of differing jurisdictions. In the early 1970s, I know of one Monaghan man who required a work permit to gain employment a few miles away in Enniskillen and families travelling from Fermanagh to holiday in Bundoran in County Donegal had to stop and show a sticker on their windscreen to prove that their car was “bonded” and legal to cross. Today, there are no border controls whatsoever. For example, drive from Clones to Cavan town (both in the Republic) and you will criss-cross Monaghan, Fermanagh and Cavan several times without realising it. There are those who insist that the line doesn’t even reflect the actual border any more. That during the conflict of the 1970s and 80s, the border effectively moved 15 to 20 miles “inland” as territory was surrendered by the British authorities and by Protestant migration. Some areas of land once owned by border Protestants now lie vacant. Unionist politicians allege that the Provisional IRA campaign engaged in a cynical tactic of “ethnic cleansing”. That is, only or eldest sons of farmers were singled out as targets for death, thereby removing the heir to the property. Through time there was no succession to farms. In other cases security fears or simply business factors meant Protestant farms would lie empty. Factor in how deep the ownership of land is in the Irish psyche and this may go some way to informing the debate as to why Protestant community, business and political leaders involve themselves in organisations which try to keep these farms in Protestant hands. It also should be said that many Protestants, even those in the part-time security forces, defiantly remained along the border and even in the changing peace process circumstances they find themselves feeling part of a vulnerable culture in a shrinking minority. The denuding of pockets of land, however, is just one factor. Birth rates and changing demographics have meant major change. While the recent census saw the Protestant-Catholic numerical balance at 48-45 per cent in Northern Ireland, the figures for Fermanagh now see a Protestant minority of 38 per cent. Bobby Sands election poster at August's Sinn Féin commemoration in Fermanagh. The result is a vastly changed political landscape in the county. While Unionists held sway in local government in the 1970s, admittedly assisted by gerrymandering, nowadays Sinn Féin is the dominant party. Fermanagh-south Tyrone was the place where the electoral rise of the modern-day Sinn Féin began. 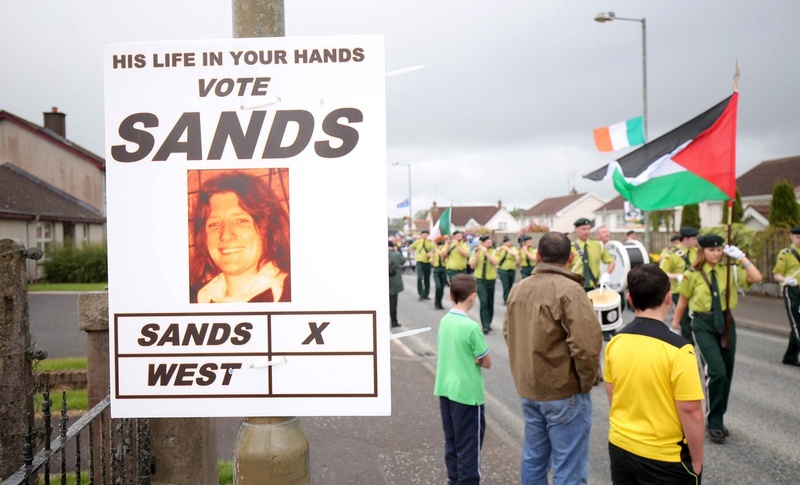 In 1981, campaigners to have hunger striker Bobby Sands elected on an anti-H block ticket met with much resistance among the Catholic political and business class of the day; but when over 30,000 ordinary voters turned out to elect Sands, it was the spark which saw the rise and rise of Sinn Féin across Northern Ireland. It is said that British Prime Minister Margaret Thatcher privately mused with her advisers about re-drawing the border; anyone doing it today would find a neat west-east demarcation and a new frontier would find an easy line down the middle of the six counties which would see a new Northern Ireland being squeezed into the eastern half. This goes a long way to explaining why Unionists regard the cockpit of Fermanagh-south Tyrone as so important as a psychological, metaphorical flying of the flag out west. There is already local speculation of another attempt at an agreed Unionist candidate at next year’s election, with an interesting theory that Arlene Foster could line up against Michelle Gildernew. Changing demographics in Fermanagh, however, don’t just have political implications. There is a major debate going on over the future of education in Fermanagh. With more than 40 primary schools in a county with a total population of just 60,000, resources issues mean that many face the dreaded sustainability question. It is no coincidence that the county, through the Fermanagh Trust, is in the vanguard of the advance of shared education, and many schools in the controlled sector are embracing the concept not least in the interests of survival. A school such as Aghadrumsee Primary, right on the border, has a roll of 33 Protestant pupils, but is surviving and thriving by maintaining links which would have been unheard of years ago. On the maintained side in post-primary schools, there has been some rationalisation with the CCMS (Council for Catholic Maintained Schools) privately accepting the need for change before closures or amalgamations are forced on them. On the controlled side, however, there is greater change. A proposal is currently with the Education Minister, John O’Dowd to amalgamate the Enniskillen Collegiate Girls Grammar School with Portora Royal School, mostly attended by boys. Aside from the irony of a Sinn Féin Minister deciding on the future of two bastions of historic Protestant educational establishment, the merger would probably copper fasten selective education in the town, with a new build for Devenish College controlled sector secondary school also on the cards. The merger debate has proved bitter and controversial. But whether the two schools remain or whether they become one, with the Integrated College also situated in Enniskillen, the current situation is that the vast majority of Protestant children over 11 in Fermanagh must travel to post-primary schools in Enniskillen. Dwindling numbers have seen the closure of controlled post-primary schools in Lisnaskea, Ballinamallard and Kesh. With a county of 650 square miles, quite large in geographical terms, this involves considerable logistical travel problems on the county’s poor roads network. A pupil from along the south-east border in Fermanagh could begin their journey to school shortly after 7 am and not get home until tea time. 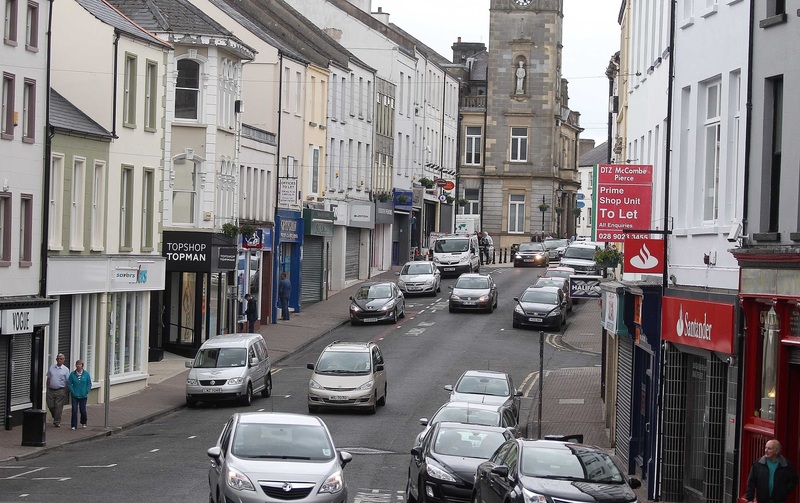 If a couple, or more, teenagers from the same family are spending such a long day at school, and possibly one or more of their parents having to travel to Enniskillen for employment, one could see why such a family would decide to move home to the county town. Furthermore, over the years there has been a perception that the authorities’ decision on matters of planning and infrastructure have been concentrated on Enniskillen. This, of course, also has implications for all sections of the community with rural life under pressure. This is particularly pronounced on the Protestant side. Without a local school, a vital hub in the community is often lost and this can be the vital catalyst for families leaving the countryside and moving to town. This removes more people from one side of the community from border areas. The idea that the border has effectively moved 40 or so miles east, however, comes with a couple of caveats. This analysis until now assumes that Catholic/Nationalists and Protestant/Unionists will vote along traditional lines in a border poll; but does the increasing numbers on both sides who refer to themselves as “Northern Irish” have any impact on this? And, in another sense it could be argued that over the last 40 years the border has become more, rather than less, of a physical one. An IRA campaign which aimed at removing the border may have had the paradoxical effect of strengthening it. British Army permanent checkpoints and patrolling, and the blowing up of roads were attempts to restrict IRA activity, but also had the effect of limiting movement of traffic both ways. That, and fear of getting caught up in the Troubles, saw a reduction of people from the south coming north. And, of course, there were further borders being set up in the hearts and minds of the two communities. If Fermanagh is a microcosm of the changing picture within and between communities along the border, it is interesting that in “peacetime” there is much organic peace-building between the two sides. Compared to Belfast, there is also a much greater tolerance of loyal order parades, though that doesn’t mean there isn’t resentment or mistrust. But there aren’t any peace walls or protest camps. A wry comment may be that the people along the border have suffered so much, that they know the alternative to failing to live together. Whatever the outcome of a border poll, and whatever implications that has for the bigger picture of national identity, drilling down to the demographic and social nature of the border lands produces a challenge to the simplistic traditional analysis of its make-up. Denzil McDaniel is a columnist and media consultant. He was editor of the Impartial Reporter newspaper in Co Fermanagh for three decades.